The model features a plethora of carbon-fiber body parts. 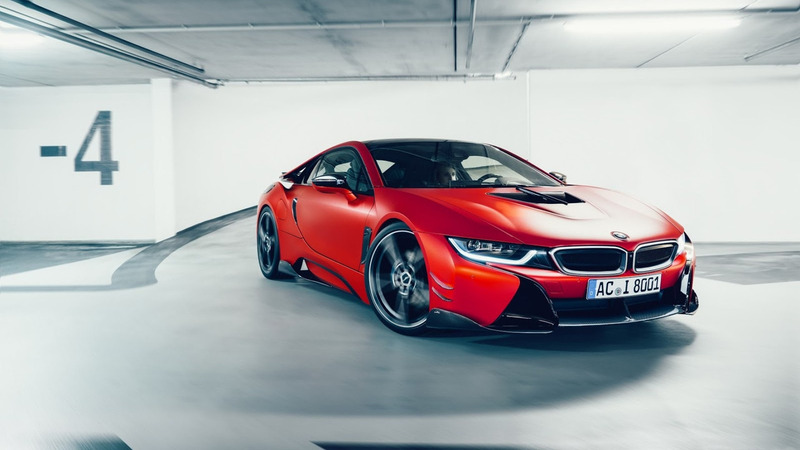 AC Schnitzer unveiled its line of carbon-fiber upgrades for the BMW i8 at the Geneva Motor Show earlier this year, and now the German tuner has proved the pieces’ abilities by taking the plug-in hybrid sports coupe around the Nürburgring Nordschleife in 8:19.8. Veteran touring car racer Markus Oestreich was behind the wheel. The upgraded i8 from AC Schnitzer features a complete carbon-fiber body kit. The extensive list of lightweight parts include replacements for the hood, grille, much of the front fascia, mirror caps, door handles, side skirts, front and rear air outlets, rear wing, and diffuser. The tuner also fits a set of forged alloy wheels that measure 8.5x21 in front and 9.5x21 in the rear, and they save 9 pounds 11 ounces (4.4 kilograms) over the stock units. A revised suspension hunkers down over the new parts by dropping the front by one inch (25 millimeters) in front and 0.8 inches (20 mm) at the back. Inside, AC Schnitzer fits the i8 with aluminum parts for the pedals and iDrive controller. A set of velour floor mats round out the aesthetic upgrades. AC Schnitzer only mentions that the powertrain “remains largely standard” without going into any detail. In stock trim, the i8 is good for 357 horsepower (266 kilowatts) and 420 pound-feet (570 Newton-meters) of torque from its turbocharged 1.5-liter three-cylinder and electric motor. This tuned i8’s lap time of 8:19.8 puts it in an odd place by current standards. For example, the latest Civic Type R with 306 hp (228 kW) can go around the Green Hell in 7:43.8. Furthermore, the Volkswagen Golf GTI Clubsport S needs 7:47.19, and the latest Ford Focus RS does it in 8:06. Even a Land Rover Range Rover Sport SVR requires 8:14. BMW may make the i8 even quicker soon, though. The company is preparing a new roadster variant, and a powertrain upgrade might accompany the ability to remove the roof. Rumors suggest the company would increase the hybrid powertrain’s output 372 hp (277 kW) and boost the battery capacity for greater electric range. The company’s teasers indicate that official details about the new body and possible drivetrain improvement should arrive soon. Aachen-based tuning specialists AC Schnitzer have convincingly proven that the driving dynamics of the most advanced sports car today, the BMW i8, can be perceptibly and above all measurably optimised by the AC Schnitzer carbon aerodynamic conversion, lowering and fitting of the AC1 forged alloys - giving the i8 by AC Schnitzer. The clock stopped at 8:19.80 min after the fastest lap of the North Loop, and with this time the i8 by AC Schnitzer joins an illustrious group of supercars, most of which have considerably more powerful engines than the plug-in hybrid, whose engine remains largely standard. AC Schnitzer carbon bonnet top, carbon middle strut for bonnet top, front grille for BMW kidney, carbon front spoiler elements, carbon middle front spoiler, carbon front side wings, carbon mirror covers, carbon air outlets front, carbon door handle panels, carbon side skirts, carbon air outlets rear, carbon Racing rear wing, 3-piece carbon rear diffuser. A new record for AC Schnitzer and yet another reason to celebrate in our Anniversary year! 30 years of AC Schnitzer – 30 years of innovations, free from all compromises and beyond the standard - and many new ideas for the coming years of success! To request further details and high resolution images you may have a look in the press area of AC Schnitzer homepage. For your personal assistance please do not hesitate to contact us anytime. Watch the video of the complete lap from the Nordschleife.